BOULDER, CO--(Marketwired - October 06, 2015) - SolidFire, the #1 Solid-State Array, today announced the general availability of the SolidFire PowerShell Tools for management and automation of SolidFire systems. This release provides SolidFire customers and partners the ability to leverage Microsoft Windows PowerShell seamlessly with other layers of their data center for the purpose of delivering consistent and programmatic management and reporting. Microsoft Windows PowerShell has rapidly become the standard for scriptable management for Microsoft Windows and VMware environments with VMware's implementation, PowerCLI, being widely adopted by VMware customers. PowerShell has gained success due to both the continued focused support of Microsoft and the low barrier to entry to learn and utilize the technology. PowerShell allows organizations to collect valuable information from their environments and manage the lifecycle of the infrastructure with a high confidence of consistency. "SolidFire's PowerShell tools enable customers to manage their environments more efficiently, eliminating the bottleneck placed on IT's ability to deliver the resources the business needs," SolidFire's VP of Corporate Development & Strategy, Dave Cahill, said. "These tools help customers realize and extend the benefits of SolidFire's automation and integration provided by our open, REST-based APIs, which are ideally suited to meet the current and ever-changing demands of the next generation data center." 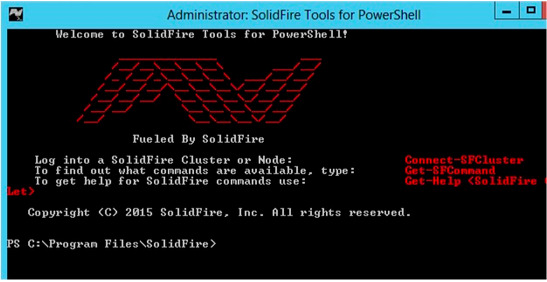 SolidFire is also providing additional capabilities to further extend this release on a GitHub software repository which includes PowerShell scripts and functions for managing SolidFire and addressing needs related to integrating with VMware environments. They are available to customers for download, along with the SolidFire PowerShell Tools, from SolidFire's PowerShell Github repository as well as our support FTP site. The current focus of these additional resources are targeted at VMware-specific environments with plans to release additional functions and scripts around Windows, Hyper-V and Citrix technologies in the near future. SolidFire's PowerShell Tools for the management and automation of SolidFire systems, which leverages SolidFire's native full-featured API, delivers a world-class PowerShell experience and allows customer to extend their PowerShell capabilities in order to solve critical business and operational challenges. To learn more about SolidFire's PowerShell Tools, download the Feature Brief.